Dell's 5130cdn color laser printer aims high—and on nearly all counts, it succeeds. It has the speed and features that a high-volume office needs, and it's also on target with its nearly perfect print quality. The initial purchase price is high, but over the long haul its superlow cost per page will save you money. 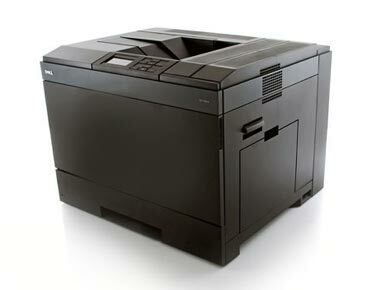 The 5130cdn is the fastest printer we've tested to date by a significant margin. On plain paper, it printed text at a rapid clip of 25.2 pages per minute (ppm). Graphics speeds ranged from 8.3 ppm for simpler graphics to 3.2 ppm for high-quality photo printing. On the Mac, using its PostScript driver, the 5130cdn was slightly less speedy: Printing plain text, it averaged 22.5 ppm, while on graphics it averaged 3.1 ppm. On both PCs and Mac, the print quality was the same. Text quality was black and crisp. Overall color quality was very good, with natural colorings and some light graininess, which was more pronounced in grayscale graphics. The 5130cdn's hulking, dullish-black exterior may look intimidating, but it houses a well-equipped and well-designed machine. The 256MB of DDR-2 standard memory is upgradable to 1.2GB. The standard paper handling includes a 550-sheet main tray and a 150-sheet multipurpose tray. If you need even more capacity, 550-sheet ($249) and 1100-sheet ($599) additional trays are available, as well as a $999 component for stapling (up to 50 sheets at a time) and stacking up to 1000 sheets. You fold down a front panel to access the toner cartridges and the separate drums, and the entire right-side panel also folds down for clearing jammed paper paths (of which we had none). The front control panel's cursor and navigation buttons, as well as the monochrome LCD, are intuitive, as is the printer's internal HTML configuration site that allows you to change settings via a Web browser. What all of that adds up to is a sense that this printer is meant to work, not play. Its 110,000-page monthly duty cycle would seem to confirm that. The 5130cdn ships with standard-size supplies: a 9000-page black cartridge ($107 to replace) and 6000-page cyan, magenta, and yellow cartridges ($195 each to replace). That's about 1.2 cents per black page and 3.3 cents per color (or 10.9 cents for a four-color page) out of the box. High-yield supplies offer greater savings: The $137, 18,000-page black cartridge costs less than 1 cent per page, and the $245, 12,000-page color cartridges cost about 2 cents per color, adding up to a superlow 6.9 cents for a four-color page. Dell's 5130cdn is a nicely designed workhorse of a color laser printer with the speed of a thoroughbred. It may seem a bit too rich for your blood, however, its consumables are affordable and the cost per page is low.